As early as March 2005 a critique was published by G.D.Holt and D.J Edwards, both academics in the Department of Civil and Building Engineering at Loughborough University, and writing for the Journal of Construction research. They stated that because of the home improvers fear of ‘cowboy syndrome’, approximately £4bn worth of required domestic repair and maintenance work actually went undone, leading to dilapidation and further disrepair. This contributes to the NERD problem discussed in part 2 of this cowboy story. The report concluded that despite several futile attempts by trade bodies and Government schemes, the best way to tackle this problem was from the ‘demand side’. This means educating the consumers and helping them learn ways to avoid cowboys. DIY Doctor and Service Magic are doing just that. Independently, the DTI reports (as early as 2001) that over 50% of UK construction companies are one man bands while 35% employ 2 or 3 workers. Many of these workers are not registered at either Companies House or with HRM and the Holt report above indicates that a great number of these people are slipping under the income tax and VAT radar. They are being allowed to make profits because many home improvers take advantage of cash offers from them. Unfortunately, as further statistics show, the ultimate cost is greater than the savings. As long ago as July 1999 the Builders Merchants Journal reported in a survey that 89% of home owners agreed that there should be a law preventing unregistered tradesmen from trading and a huge 95% agreed that, at the very least, workers in the building industry should be registered like workers in other industries. In the Contract Journal, January 2003, a further survey carried out by NEMS, a market research company, showed that 51% of people do not trust tradesmen, 40% say they would never use someone who was not approved and 54% would be happy to pay more to use an approved tradesman. 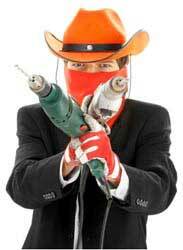 You can find out more about avoiding cowboy builders by using our Home Improver Protection Solution. Please post your comments to help us provide the best support we can for home improvers.